After being plagued by Bluetooth pairing and LTE connectivity issues, Pixel phone users are now reporting another bug. According to user reports, screenshots sent from an iPhone 7 Plus to a Google Pixel or Google Pixel XL phone are getting distorted automatically. 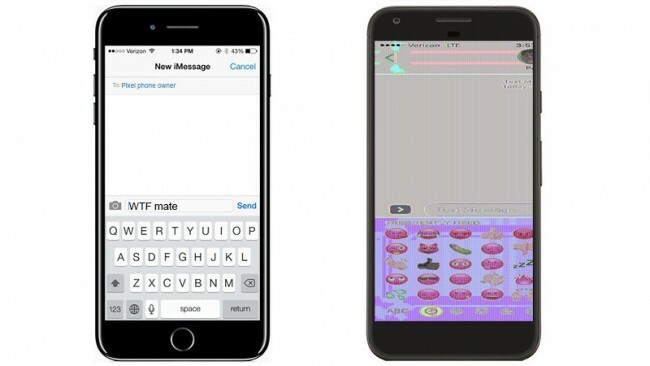 The distorted screenshot issue is being discussed on a Google Product forums page extensively, and users are reporting that only a screenshot received from an iPhone 7 Plus is affected. The iPhone 7 Plus is Apple’s latest most expensive iPhone offering in the market. The issue appears when a screenshot is sent via hangouts or any other SMS/MMS app. Furthermore, sending a screenshot of the home screen does not cause any distortion, but a screenshot from within any app – be it first-party or third-party – gets distorted. The issue is said to only occur when a screenshot is shared by an iPhone 7 Plus user with a Pixel phone user, and not vice versa. This means screenshots sent through a Pixel phone to an iPhone 7 Plus user are received without any hiccups. Apart from Pixel phone users, some Nexus 6 users running on Android 7.1 Nougat have also taken to the forum to report the same issue. As Nexus 6 has not got the Android 7.1 Developer Preview yet, these phones might have presumably installed it via a custom ROM. However, this hints that there is some issue in how image processing is handled on Android 7.1 Nougat. There is no word on if Google intends to roll out a fix for this or not. Just to recap, Pixel phones were earlier plagued with a connectivity issue particularly on the LTE band 4 frequency, which seems to have been fixed with the latest security patch rolled out last week. However, some users are still reporting that Bluetooth pairing issues with their cars through their Pixel phones.